With Mr. Putin putting Russian orphans in the news by barring American adoptions, I was reminded of our encounters with Bulgarian orphanages. 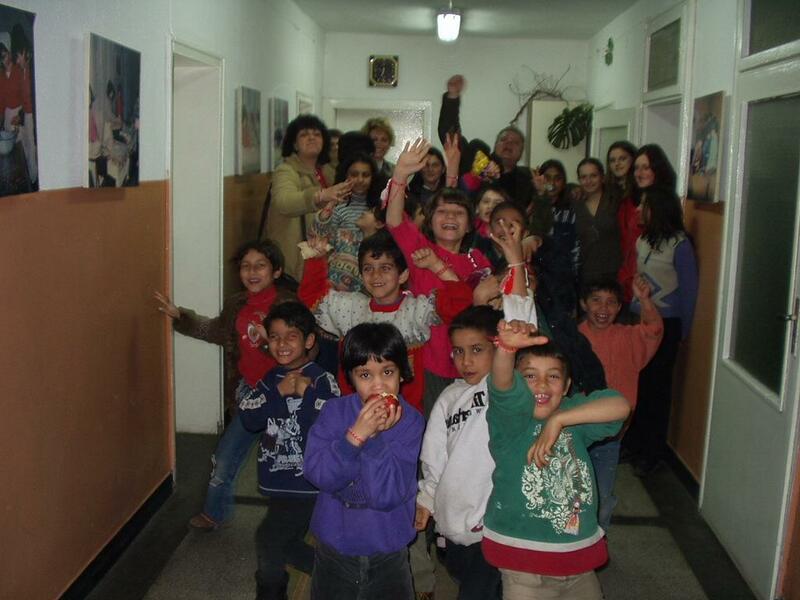 During our time in Bulgaria we visited several orphanages, some rather bleak and struggling to carry out their mission. We also know several people and organizations working to close them down, or most of them, with the ideal that having children institutionalized should be a last resort, with family placement higher on the list of possibilities. The Ana Gizdova Home for Orphaned Children in Bratsigovo was a bright and cheery place, well-organized and staffed, with good community support and access to the necessary resources. We got to know some of the children through frequent visits following our first visit, described in this story, when some friends took us there to show us around. The story is told in A Breeze in Bulgaria (excerpt beginning on p. 125). We pulled up through a courtyard to a small door. As soon as our arrival was discovered, [our friends] Vessi and The Doctor and Gencha were mobbed. The kids obviously knew them and were excited to see them again. All of them, and soon we too, had arms full of little kids jostling and wiggling to be picked up and held, and older ones touching arms, smiling, talking softly. We went straight to a room where teachers, caregivers and some other guests were seated, and joined the group at tables set with pastries, candies and bottles of rakiya. It was a party for the staff and guests, a special occasion…. A few kids were in the room, some on the adults’ laps and others snuggling up to the nearest adult. The congenial Doctor had more clustered around him than did the other adults. I wondered if the children in the room were selectively let in or if they were just braver or more inquisitive than the ones who remained in the other rooms. After a while, Vessi and The Doctor pulled out a box of martenitsas. The kids started crowding around to get them. Vessi’s mother had made them, almost a hundred in all, red and white yarn bracelets and pendants in dozens of varieties, each tied and trimmed carefully. Each martenitsa was presented individually, with personal good wishes exchanged in a little ceremony of individual acknowledgement. We went into an adjoining playroom with some of the younger kids, and I took some pictures. The kids were fascinated to the point of obsession with having a picture (snimka) taken. “Me with him he’s my best friend no not you, you get back just him and me, now now snimka me snimka me me and him.” Small groups, large groups, on laps and in arms, reading, singing, smiling, posing. Later we returned to the teachers’ room and visited some more. Kids came in and out freely. [The Orphanage Director] Mrs. Naidenova asked if we could interpret an email she had gotten in English. It was from an American Army sergeant who had been there with a group of soldiers from several countries over the summer, donating repairs and supplies. He and his wife were sending some money for a birthday gift for one of the girls, and the email gave instructions for getting it from the local bank. As were leaving the building, we lingered in the hall near the doorway with an excited and smiling cluster of kids smiling and talking, some showing off English or German or French words they knew. One little group broke out into a rendition of “My Bonnie Is Over the Ocean” they had learned in school. Some of the kids asked if we would come and give English lessons, and help with their homework. We were hooked. As soon as we got home, we checked our maps and bus schedules to see how to get there on our own, on a regular basis without the driver provided for the day’s special occasion. There were only two buses a day from Pazardjik to Bratsigovo, but they were at convenient times. As a backup, buses left hourly for Peshtera, and probably once we got to Peshtera it would be easy to find a way to cover the remaining few kilometers to Bratsigovo one way or another. To come and get the reward of these kids’ smiles and excitement, who could resist? This entry was posted in About the area, About the People, Volunteering by Bruce McDonald. Bookmark the permalink.